This tag identifies items in Genesis which correspond to what is seen in New Jerusalem. Where Does the River Flow Today? In New Jerusalem there is “a river of water of life, bright as crystal, proceeding out of the throne of God and of the Lamb” (Rev. 22:1). The river of New Jerusalem in Revelation is “of life” and this life is the eternal life of God. This is not a physical river but a spiritual river. This river flows in everyone who comes to the Lord. To come is to drink. This drinking is spiritual: “we were all given to drink one Spirit” (1 Cor. 12:13). Isaiah 12:3, “Draw water with rejoicing from the springs of salvation.” When we praise the Lord, we are drinking. And Isaiah 55:1, 6, “Everyone who thirsts, come to the waters….Call upon Him while He is near.” The Lord is rich to all who call upon Him; this is another way to drink the river. 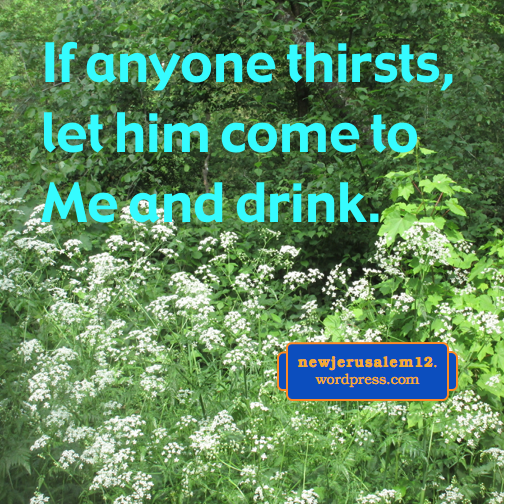 The river of New Jerusalem is the same flowing Spirit we drink today. 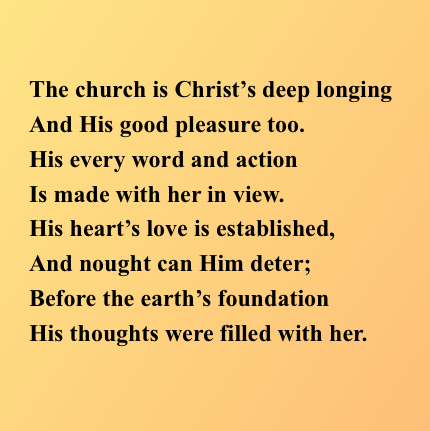 We look at a song about Christ’s love for the church, a love clearly stated in Ephesians 5:25-27. This statement is in the context of human marriage as a portrait of Christ and His wife, the church in Ephesians and New Jerusalem in Revelation. The graphic begins with part of the second verse of the song. Creation is presented in Genesis, but the church and New Jerusalem are the “mystery which has been hidden from the ages” until after the resurrection of Christ. Although it was not revealed before the resurrection, as the song says, it was “hidden in God” and hinted by the story of Adam and Eve in Genesis 2. 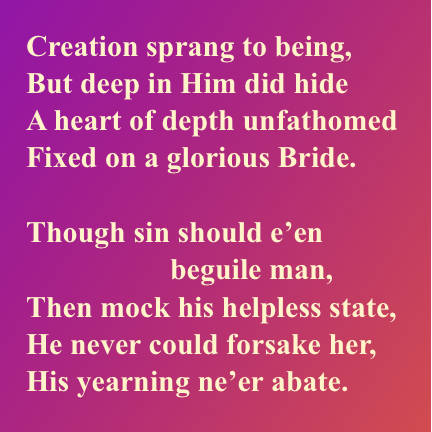 The graphic continues with part of the third verse of the song. Sin entered and man was shut out of the garden of Eden, with no chance to be one with God. Man’s helpless state is shown in many ways through the Bible, for example in Romans 7. Nevertheless, Christ’s love for the church and His longing for New Jerusalem did not end. He is not discouraged. Even during the Old Testament times, God sometimes spoke of Himself as the Husband of His people (e.g. Jer. 31:32). God waited for the time proper in His divine view, the time to come in incarnation, the time to manifest His love for mankind. Continued in the next post. Bible verses quoted in these posts are from The Holy Bible, Recovery Version, published and © by Living Stream Ministry, Anaheim CA, 2003. The New Testament of this Bible, with its outlines, footnotes, and cross-references, is at online.recoveryversion.org; this too is © by Living Stream Ministry. This expression of love is in the context of human marriage, which is a pattern of Christ and the church. Christ and the church as Husband and wife eventually develops to Christ and New Jerusalem as Husband and wife (Rev. 21:9-10). This song says, “Before the earth’s foundation His thoughts were filled with her.” This eternal thought is unveiled in Genesis 2. Man was created and then placed in front of the tree of life. With the tree of life is a river (of life) and out of these came Eve, the wife of Adam. This is a picture of Christ desiring to become our life so that we match Him and can become His counterpart, His wife, first as the church, then as New Jerusalem. New Jerusalem is the consummation of all God’s work, a corporate composition of all His people to glorify Him and to reign with Him. This fulfills God’s intention in Genesis 1:26 in creating man in His image and giving man dominion. However, the devil tempted man, man fell into sin and death. God called Israel as an outward picture of what He wants to do, but the reality was hidden until God came in the man Jesus. 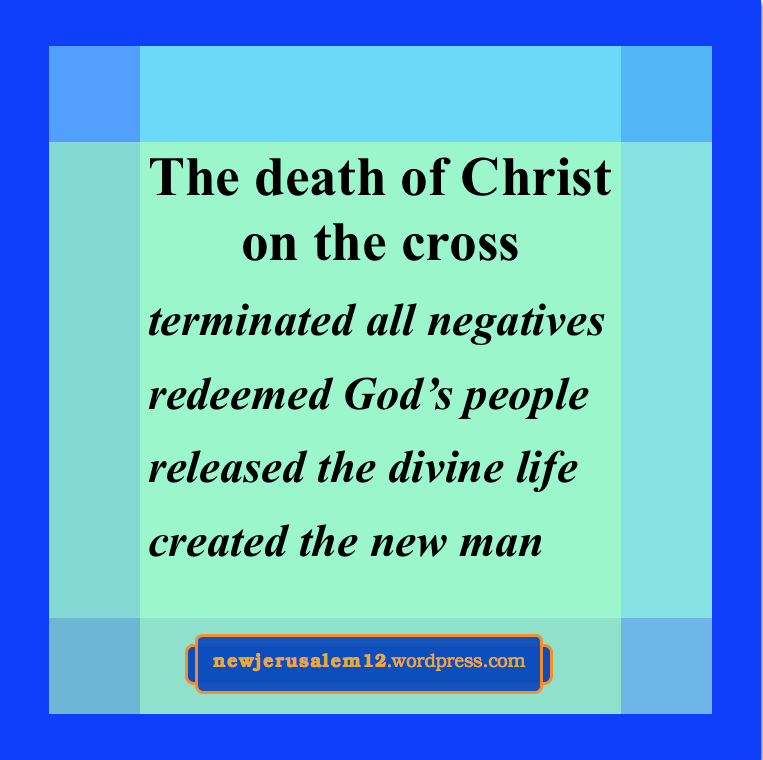 In Him God was incarnated to live a God-man life, to die on the cross, and to be resurrected. The Lord’s death on the cross and His resurrection are crucial accomplishments not only for our present Christian life but also for us to get to New Jerusalem. Both the Lord Jesus, the Bridegroom, and New Jerusalem, the bride, come down out of heaven. The two correspond to each other, as Eve corresponded to and complemented Adam in Genesis 2. Eve is a strong contrast to the animals God created; among them “for Adam there was not found a helper as his counterpart” (Gen. 2:20). Eve was the complement to Adam because she came out of Adam. God built Eve with the rib He had taken out of Adam. New Jerusalem comes out of heaven because it is composed of the life and nature of Christ imparted into us in His resurrection. First Corinthians 15:47-48 make a contrast, “The first man [Adam] is out of the earth, earthy; the second man [Christ] is out of heaven. As the earthy is, such are they also that are earthy; and as the heavenly is, such are they also that are heavenly.” As the heavenly new creatures, we compose the heavenly bride, New Jerusalem, which matches the heavenly Bridegroom, Jesus Christ. 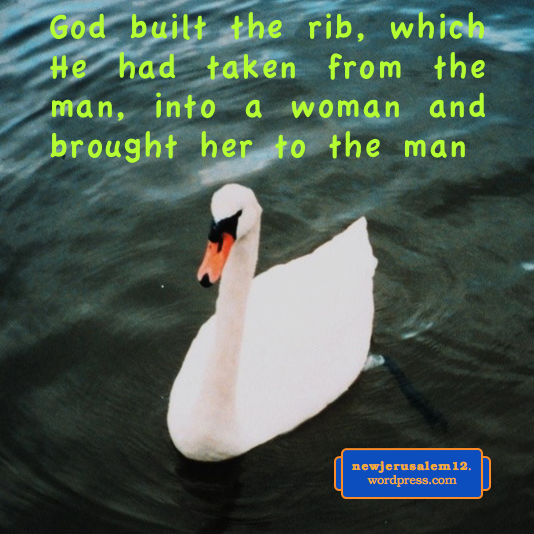 In Genesis 2 God built the rib, which He had taken from Adam, into Eve and brought her to Adam. No other creature could be Adam’s counterpart, but Adam welcomed Eve as his counterpart. This is a picture that the church, growing into New Jerusalem, is built with Christ to be presented to Him as His wife. God took the rib from Adam while he was in “a deep sleep.” Sleep here signifies death, as in John 11:11-13 and 1 Thessa-lonians 4:13-16. Then Adam was awake, signifying resurrection, and Eve was brought to him. Like Eve, both the church and New Jerusalem come forth through the death and resurrection of Christ. Through death Christ both redeemed us and released His divine life, which was imparted into us in resurrection. Now “Christ is our life” (Col. 3:4). Christ our life, not our natural life (which must be denied), is the life of the church and of New Jerusalem. It is by this life that the bride of Christ is prepared. This life is imparted by the Spirit. “It is the Spirit who gives life; the flesh profits nothing” (John 6:63). “The Spirit gives life” (2 Cor. 3:6). However, this Spirit is not separate from Christ. 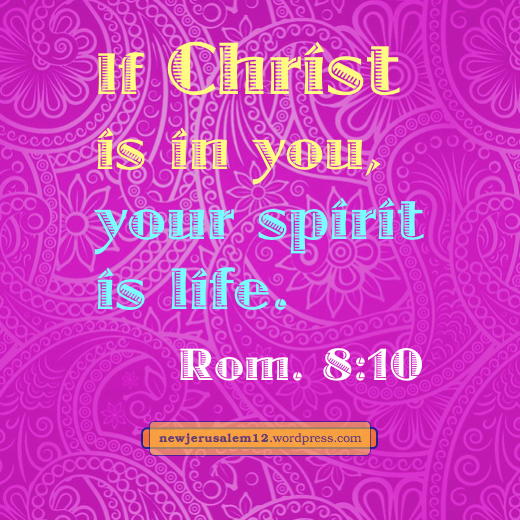 He, as the Spirit, enters into our human spirit; as a result, “If Christ is in you, though the body is dead because of sin, the spirit* is life because of righteousness” (Rom. 8:10). Christ our life energizes us to deny our natural life, our self, and Christ our life grows until in the church, the new man, “Christ is all and in all” (Col. 3:11). By His being all and in all His members, He can present the church to Himself glorious (Eph. 5:27). In the new creation and New Jerusalem there will be no self left to deny and absolutely Christ will be all and in all. For more about the church, the precursor of New Jerusalem, coming out of Christ to be presented to Christ, see chapter 2 in The Glorious Church by Watchman Nee. It can be freely downloaded from Bibles for America (English) or Rhema Literature (30 languages). * This is our human spirit because 1) it is contrasted with our human body and 2) the divine Spirit is life whether Christ is in us or not. Genesis 2:21-22: “Jehovah God caused a deep sleep to fall upon the man, and he slept; and He took one of his ribs and closed up the flesh in its place. And Jehovah God built the rib, which He had taken from the man, into a woman and brought her to the man.” This first human couple is a picture of Christ and the church (Eph. 5:23-32) which consummates in Christ and New Jerusalem as the eternal marriage (Rev. 21:1–22:5). Prior to the formation of Eve, God brought every living creature to Adam. “The man gave names to all cattle and to the birds of heaven and to every animal of the field, but for Adam there was not found a helper as his counterpart” (Gen. 2:20). No other creatures was a match for Adam. But, when Eve was brought to Adam, “The man said, This time this is bone of my bones and flesh of my flesh; this one shall be called Woman because out of Man this one was taken. Therefore a man shall leave his father and his mother and shall cleave to his wife, and they shall become one flesh” (Gen. 2:23-24). The inability of the creatures to match Adam, and the wonderful correspondence of Eve to Adam shows that only what came out of Adam matches him to be his counterpart. In the same way, only what comes out of Christ can match Him to be His counterpart/ companion/suitable helper*. New Jerusalem is the bride, the wife of Jesus Christ. According to the pattern in Genesis 2, New Jerusalem should come out of Christ to be the proper match to be presented to Him. * Various translations in Gen. 2:20, thanks to Bible Hub. 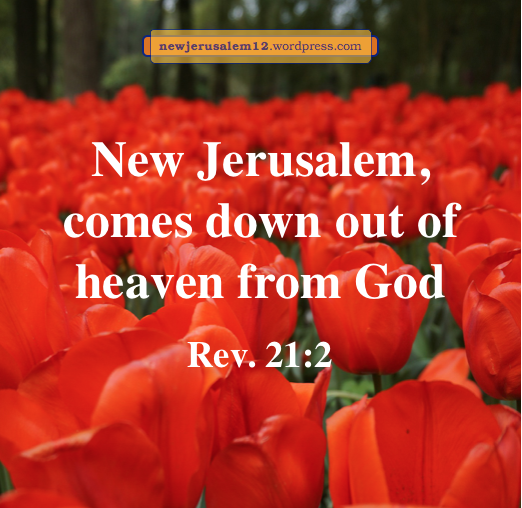 New Jerusalem is the lovely center of the new creation, blessed with the presence of God and the Lamb, full of God’s glory, and supplied by the river of life and tree of life. Due to the rebellion of Satan and the fall of man, the old creation was corrupted. and man was separated from God. To us, this would be very discouraging. However, to God, this is a big opportunity to display His unlimited wisdom. Out of all the corruption God will bring forth a new, perfect creation with New Jerusalem as His eternal dwelling. The sweat here indicates the need of human effort, separated from God’s blessing, to supply the essentials for human living. Man was shut out from the garden of Eden, which contained “every tree that is pleasant to the sight and good for food” and had to expend his own sweat-producing energy. Because New Jerusalem will be filled with God and His blessings and no curse, there will be no need for man’s effort and no sweat. 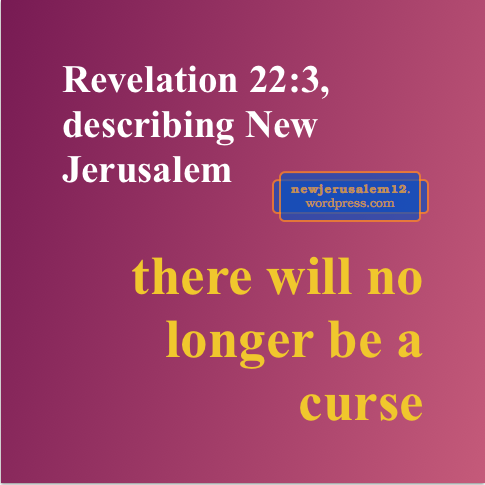 Also, without the curse, there will be no thorns in New Jerusalem. 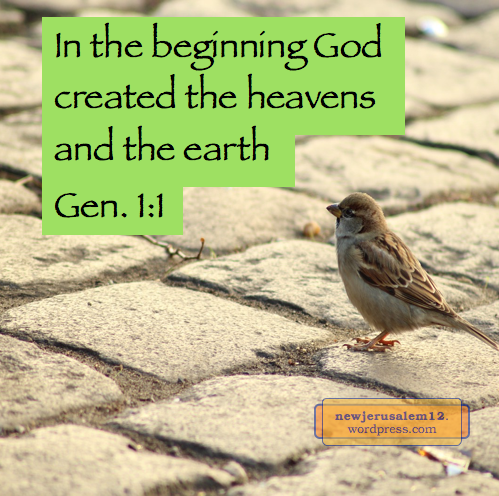 The Bible progresses from God’s creation of heaven and earth in Genesis 1 to the new heaven and new earth with New Jerusalem in Revelation 21–22. Here is a summary of recent posts on this progression, with a link to and a key verse from each post. All of these point toward New Jerusalem, the goal of God’s creation and His work. God created because He has an eternal purpose. We do not yet see this outwardly, but we do see Jesus and His accomplishments. Hebrews 2 quotes Psalm 8 and then speaks of God leading many sons into glory, which ultimately is New Jerusalem; then we will see God’s name excellent in all the earth. God is never defeated on the path from creation to New Jerusalem. God has a purpose and we cooperate by praying for it on earth. “Until heaven and earth pass away…” (Matt. 5:18). The first heaven and earth will pass away and the new heaven and earth will come. God’s divine power supplies us to live a life for the new creation. The Lord told us “My words shall by no means pass away.” Our stand is His word. We are being renewed inwardly (Titus 3:5) to prepare us fully for New Jerusalem. Our spirit is life and our heart loves the Lord and His word; this is what matters. God’s desire is to display His wisdom through His people knit together in Christ. This display brings forth glory to God now in the church and forever in New Jerusalem. In our human spirit that we are born of God to have His life for His expression. God created the earth for His purpose; Satan formed the world system to capture man. God’s living word energizes us to live to Him and escape the corruption in the world. This abode is for today and eternity. New Jerusalem is God’s eternal abode in His people. “We are expecting new heavens and a new earth.” (2 Pet. 3:13). The Lord overcame the world and now He is the Overcomer in us. He is our life. Through the death of Christ, things on earth and in heaven were reconciled to God. This is a step in preparing for the new creation with New Jerusalem as its center. The sea speaks of God’s judgments, which are completed in Revelation 20. Earlier posts about the new creation. Revelation 21:1: “I saw a new heaven and a new earth; for the first heaven and the first earth passed away, and the sea is no more.” Many recent posts are on the new heaven and the new earth. These will be with New Jerusalem but, as stated in this verse, without the sea. There is no more sea because the sea is a result of God’s judgments on the corrupted earth. We are likely familiar with the flood in Noah’s time, which covered the entire earth with a sea of water. This was because “the wickedness of man was great in the earth” (Gen. 6:5). After this, God promised that never again would waters cover the earth to destroy everything (Gen. 9:11-16). Prior to this there was another flood. In Genesis 1:1 “God created the heavens and the earth.” This creation was pleasant. Isaiah 45:18 declares that God “formed the earth and made it; He established it; He did not create it waste.” However, due to Satan’s rebellion, “the earth became waste and emptiness, and darkness was on the surface of the deep” (Gen. 1:2). As a result of the judgment in verse 2, there was no land—no place for man to live for God’s purpose. Water covered the earth. But, as in Noah’s time, God restored the earth. “God said, Let the waters under the heavens be gathered together into one place, and let the dry land appear; and it was so” (Gen. 1:9). Revelation 21 is a full, complete renovation. It has the new earth for the nations to live on, New Jerusalem as God’s dwelling with His people on earth, and no more sea, no leftover from the prior judgments. Praise God that everything is new! Genesis 1:1 says, “In the beginning God created the heavens and the earth“. 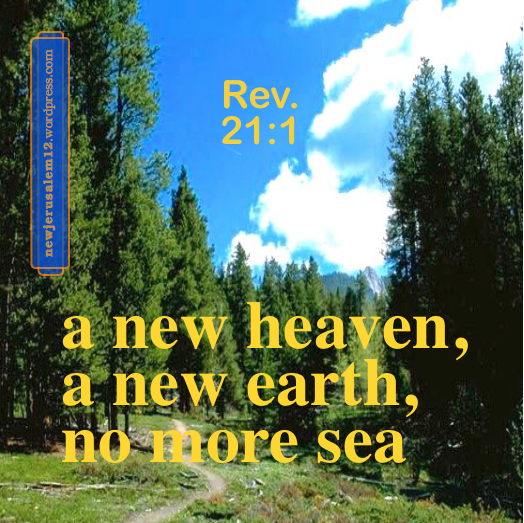 Revelation 21 begins, “I saw a new heaven and a new earth.” Let’s look briefly at the path from the original earth to the new earth with New Jerusalem. Genesis 1:2a says, “the earth became waste and emptiness, and darkness was on the surface of the deep.” This “becoming” was not God’s intention. Isaiah 45:18 tells us “He is the God Who formed the earth and made it; He established it; He did not create it waste.” How did the earth become waste? This was due to Satan’s rebellion*. Genesis 1:2 continues with “the Spirit of God was brooding upon the surface of the waters.” Then, in a process of restoration, there was light, dry land appearing, more definite lights, many forms of life, and finally man. During the restoration God said “good” six times and then “very good” after man was created. However, the “very good” earth with man as its focus was corrupted in Genesis 3. But God is not defeated! Before Jesus Christ came as the reality, God did something through Abraham, Moses, Samuel, David, Solomon, and many others. Through David and Solomon the city of Jerusalem was gained and the temple was built. Four hundred years later degradation resulted in the captivity to Babylon, but again, God was not defeated. A return to Jerusalem was made and the temple and city rebuilt. This provided the setting in which Jesus was born. The next posts will look at the path to bring the earth from Jesus’ incarnation to New Jerusalem. * Isaiah 14:12-15. For more, please read Life-study of Genesis, message 2. In Isaiah 43 God speaks of gathering His scattered people, “Everyone who is called by My name, whom I have created, formed, and even made for My glory” (v. 7). The words create, form, and make all appear in Genesis 1–2 (e.g. 1:1, 26; 2:4, 7-8). The declaration in Isaiah 43:7 shows us that all God’s work from the beginning of creation has a goal—His glory. God created us not merely to live a good human life. God put man in the garden of Eden with the tree of life. This is a picture of God wanting to be life to us. This picture in Genesis 2 is before sin, before death, before the curse, before rebellion against God. God being life to us is not a reaction to these negatives. God wants His life to be received by us, to be in us for His glory. The tree of life is also in New Jerusalem. Christ has become life to all His believers and is our life eternally. This life operates in us to transform us and build us together to be His corporate Body in this age and to be the city of New Jerusalem in eternity. This is “for God’s glory.” New Jerusalem “has the glory of God” (Rev. 21:11). The glory of God illuminates New Jerusalem (21:23). And, because the city is like clear, transparent glass (21:11, 18, 21), God’s illuminating glory will shine out through the city. In these verses we see three steps. 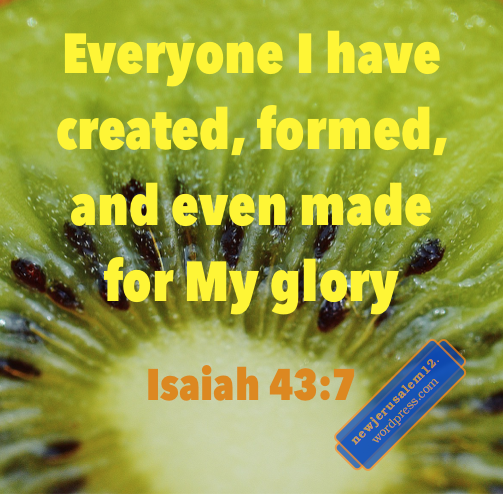 First, God created, formed, and made us. Second, God in Christ became life to us. Third, the result is God’s glory. These three steps cover the entire Bible, from creation to New Jerusalem.